The main door of the church, the west door, has an ogee arch, each side being made up of two curves which meet at an apex, an unusual feature in this part of Norfolk. The north and south walls of the porch support large boards, on which are written the Ten Command¬ments. These were formerly on top of the reredos in the chancel; at the instigation of the Rev. W. E. C. Partridge they were moved to their present position in the early 1930s by Mr. Ambrose Smith. As there are somewhat similar windows at Thompson and Ashill nearby and Ashill also has an ogee arch, perhaps the same mason or architect was employed at all three places. (1) John / Hewett / Plumber & glazier / Painter etc / Caston / Feby 17 1832 (2) William George / Bowles glazier plumber / Caston / Anno Domini 1841 (3) Samuel Reeve / Plumber & Glazier / Caston / Feby 26 1870. A PEAL OF 5040 CHANGES OF MINOR! Being two extents each of Oxford Treble Bob / and Kent Treble Bob and three extents of / Plain Bob. Mr. Banham was captain of the Caston band of ringers of which the writer and Mr. William Mann, now teaching in Leicester, were members. Mr. Phillippo and Mr. Arnold were from Bunwell while Mr. Peter Newing was a friend of the writer and came from Littlebourne near Canterbury, Kent. As a lay reader he conducted a number of services at Caston during Canon King's ministry, and, now ordained, is priest-in-charge of Tibberton and Taynton, near Gloucester. The second floor of the tower houses the clock, plates on it bearing the inscriptions:¬(1) R. PALMER MAKER /1854/ WEST TOFTS / NORFOLK. (2) The Revd Augustus Sutton, Rector of West Tofts, / constructed this Clock for the Parishioners of / Caston, and set it up in this Church tower / on the 31st day of July 1854. The clock was collected from West Tofts, now a depopulated village in the Ministry of Defence's Stanford Permanent Training Area, and transported by horse and cart to Caston by Mr. John Sayer, farm bailiff to the Rev. Walter John Partridge and great grandfather to Mr. Charles Banham. The cost of the clock, £49 lOs. Od., was for materials and workmen's wages only, as Mr. Sutton did not charge for time. 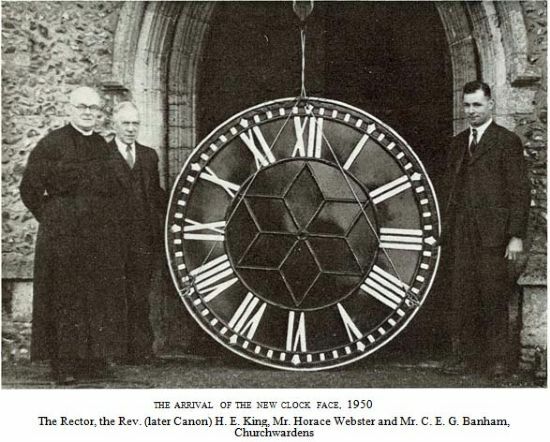 The dial, its black and white face repainted in about 1930 to resemble a giant sunflower with dark centre and gold petals, lasted for 96 years, being replaced in 1950 by one made by Smiths of Derby at a cost of about £125. Some worn wheels were also replaced in 1950 and various odd jobs have been done since, mainly by Mr. Banham, in replacing broken pins on the wheel of the escapement mechanism, and more notably in 1969 by Mr. Harry Nicholls, proprietor of Caston Garage, and members of R.A.F. Watton, who made new parts. The hours are struck on the tenor (the heaviest) bell. From the clock room, whose floor also contains a trap door for passage of the bells, is an access door to the interior of the nave roof, and from which may be admired the fine scissor type trusses bridging the gap between the thatch above and the barrel-shaped chestnut panelling below. The bells hang from wooden headstocks to which the heavier five are attached by loops called canons. Those of the third and the tenor are cabled and one canon on the third is an iron replacement. The frame is of oak and the bearings are plain. The sliders of 1,2,3 and 6 are of traditional pattern but those of 4 and 5 are of iron and are pivoted downwards from the head of the frame. The clock hammer strikes on the tenor. The treble and second bells swing north-south, the remainder east-west. L'Estrange records that in the 6th year of the reign of Edward VI (i.e. in 1552) there were three bells at Caston. From the Visitation Inventories it appears that from 1706 to 1756 there were five bells, but in 1756 or early in 1757 these were disposed of and a fresh ring of six was installed by Joseph Mallos or Mallows of Dereham. Of these Mallos cast the treble himself, having purchased the remainder from West Harling church where the tower was unable to support their weight. The parishioners had obtained a faculty to dismantle tower and spire and sell four of their five bells, but in fact all five were sold. Cast by an anonymous founder, they had been presented to West Harling church by Joshua Draper, presumably a parishioner. Prior to this West Harling had possessed three bells, the heaviest of which bore the inscription Virgo Coronata Duc Nos Ad Regna Beata [Blessed Virgin, guide us to the heavenly kingdom], an inscription used by the fifteenth century Norwich founders. If these old bells were melted down and their metal re-used, then perhaps some of Caston's bell metal dates from that century. That Thursday the 10th inst is the day appointed to open that peal of six BELLS at Easton (sic) near Walton (sic), in Norfolk, the five biggest Bells were formerly at West Harling, the Treble of the six, is entire New, cast by JOSEPH MALLOWS Bell Founder at East Dereham in the said County, by whom the whole Peal- is well being and completed. A dinner will be provided at the Red Lion, where all Gentlemen Ringers and Others, that will oblige us with their Company, shall meet with a hearty Welcome from their humble Servant, Roger Tallbot". Quite clearly this should have referred to Caston near Watton. Let us hope that many would-be visitors discovered the error, for clearly this was a great day for Caston. By 1907 the second bell had become cracked and was recast by Warners of London, the new bell weighing some 18 Ibs. less than its predecessor. Together with the other five bells, which were quarter-turned (i.e. turned through 90 degrees to prevent excessive wear), it was re-hung by Messrs. Day of Eye, Suffolk. In 1932 minor repairs, including drilling out the cast-in crown staple and through-bolting of the treble and strengthening of the wooden frame, were carried out by Alfred Bowell of Ipswich. The tower roof was renewed in 1907.